Some time ago i decided to make the leap from Canon over to the Fuji X system, and quite frankly, i’ve not looked back. Now I’m not saying i disliked Canon, moreover, i had many happy years shooting with various Canon DSLR’s, it’s just that the Fuji X system seemed to just suit me and my way of shooting. I suppose it’s like a pair of underpants, some fit well, others not so, you can’t explain it but they just do, lol. Now, ask me to say what my way of shooting is and i couldn’t possibly tell you. I’m a small chap and i like to feel at ease when shooting, free to float around, especially when shooting busy weddings, and not feel weighted down with cumbersome gear etc. If the full frame DSLR’s suits YOU stick with them. Anyway, since making the move to Fuji i’ve amassed a collection of Lens’, both primes and zooms and recently pondered which to take for a planned day trip to London for a birthday jolly outing. I wanted to travel light, and as this was a family trip, photography was not the main purpose of the day. I elected to take just the one camera, my XT2, and just one lens, the XF 18-55mm, the Fuji equivalent of a kit lens. Its a lens that often gets left at home in preference of my primes, especially for shooting weddings etc, but decided to make the most of what this combination could give. So, no tripod, no filters, no big zoom lens’s, i was free to ‘float around’ and have a good old family day out, while quickly grabbing the odd image. As you’ll see from the images below just a day in London does not give you too much time to take it all in, so as my son wanted to visit the Tower of London that was the main part of our day. If you’ve never done the Beefeater guided tour you MUST put it on your ‘todo’ list. Their historical knowledge, humour, quick wit and amazing character make the entrance fee with while alone. You could quite easily spend the whole day in the Tower and there is all manner of things to photograph but i tried to take a few different images away from the usual ‘tourist’ snap shots, let me know what you think. Our second port of call was to take in the ‘View from the Shard’ which was a short 20 minute walk from the Tower via London bridge. I managed to grab a few long exposures using the bridge wall as a camera rest, remember i had no tripod, and then some concrete bollards. Sadly, these concrete bollards were put in place after the recent terrorists atrocities that took place here a few months back. The view from the shard is quite amazing but its hard to avoid the reflections on the glass and there were no elevated positions on which to place my camera, so, i ramped up the ISO, opened up the aperture and took a few handheld shots. They are not the best but certainly show the view we had. I’m hoping to plan another visit which will take in a pre booked good sunset, lol. I thoroughly enjoyed travelling with just one camera & one lens and will make the effort to use that ‘kit lens’ a little more. I’d love to hear your thoughts and how you travel with your camera gear. Do you try to travel light, or do you take a full compliment of lens’s etc? I’ve been lucky enough to do a fair bit of travelling over the years. Unfortunately much of this was before the photography bug had bitten me. Anyway, having planned a surprise birthday treat for my daughter i figured that this would also be a fab opportunity to try my hand at a little travel photography. I’d visited Morocco some 15+ years ago and had many fond memories of the culture, people and lifestyle of this amazing country. The sights, smells & tastes of the spice markets & street food were a bewildering attack on all of your senses and i was excited to experience these again, with my daughter, and this time with my camera in hand. I was also keen to pay a little attention to the amazing architecture that still exists in this country, some of which has not changed its appearance for hundreds of years. From the mystical medina of Marrakech’s old town to the long abandoned Casbah’s on the edge of the Sahara desert there was certainly plenty to capture our attention. For the trip i travelled light from a photographers point of view, with just 2 Fuji XT-1’s and a small selection of prime & zoom lens’. 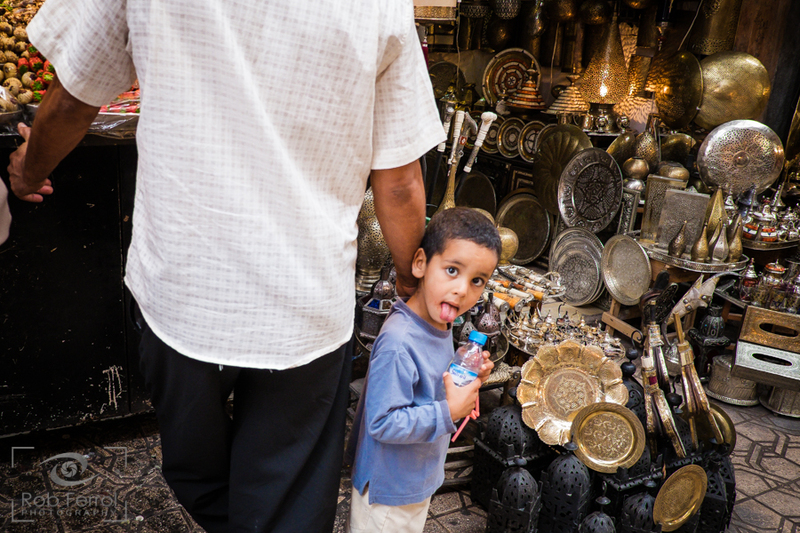 The cameras were amazing to work with, especially in the tight confines of the Souks. I was able to work relatively unnoticed and if you’ve ever been to Marrakech you’ll know how difficult it can sometimes be photographing on the streets. Many people dont like having their photograph taken and those that do often come asking for money for the privilege. Marrakech itself is a city that is full of life, it never seems to sleep. That said, it’s at night that it seems its liveliest. We travelled in July and, true to our expectations, the heat of the day was pretty much unbearable, hence the reason many stay indoors during the day and emerge at night when the temperature had dropped a little. Talking of the temperature, towards the end of our stay the temp was 45 degrees Celsius and with the heat index of the stiff Saharan wind this felt more like 49 degrees celsius. Anyway, the buzz of the Medina at night, especially on the Jemaa El-Fnaa is a must for any traveller to Morocco but watch out for the Snakes & Monkeys!! 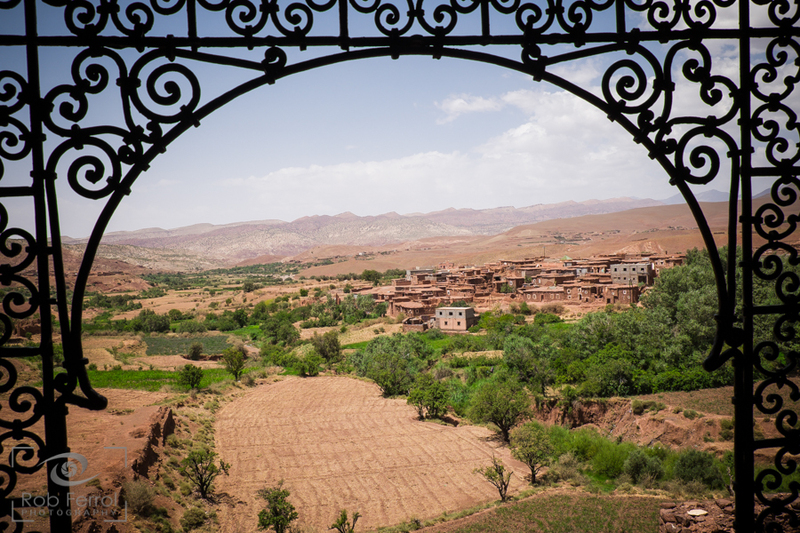 So, enough of the blurb heres a selection of images from our trip which includes Marrakech and our excursion through the High Atlas Mountains to the edge of the Sahara Desert to visit the ancient Casbah’s of Telouet and Ait Ben-Haddou. 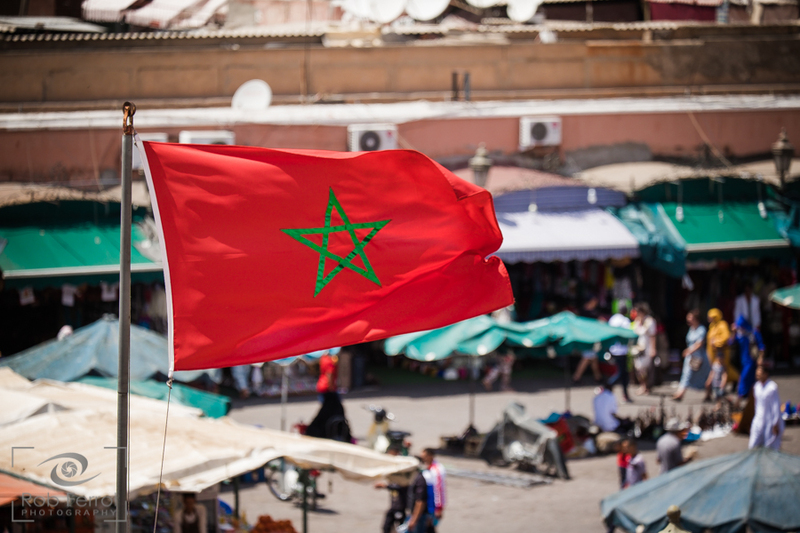 The Moroccan Flag. The green pentagram represents the 5 Pillars of Islam. With Snake charmers, Monkeys, food & entertainers the square of Jemaa El-Fnaa (square of the dead) is a full-on sensory overload but certainly a must see!! The Koutoubia Mosque, the largest in Africa, sits close by to the west of the square and if the towering minaret doesn’t grab your attention the call to prayer certainly will. Views of all the activity are best viewed from one of the many cafes that offer roof top terraces and one of my favs was the Le Grande Balcon Du Cafe which offered panoramic views and there most amazing spot for capturing the sunset, but get there early to secure your space. The tanneries are somewhat of an experience and if your a little sensitive to strong odours then maybe its not for you. But, if you do visit you’ll be given a bunch of mint leaves to ward off the smells a little and a whistle stop tour finishing of being taken to see the “finished products” AKA the leather shop. Here you will experience the most amazing display of leather goods but also the most amazing level of pressure sales you’ll probably ever come across. Don’t be forced into buying if you dont want anything but if you do, be sure to bargain hard and firm. 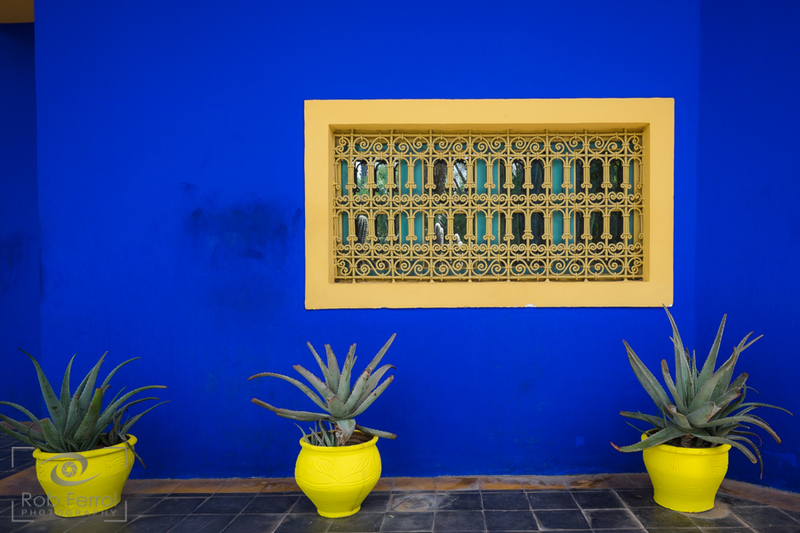 The tropical gardens, Jardin Marjorelle, offer some respite from the madness of Jemaa El-Fnaa with their abundant collection of exotic Cactus and other plants & palms set around the deep blue of the buildings that were once an artists studio. Until 2008 the gardens were owned by the designer Yves Saint Laurent. 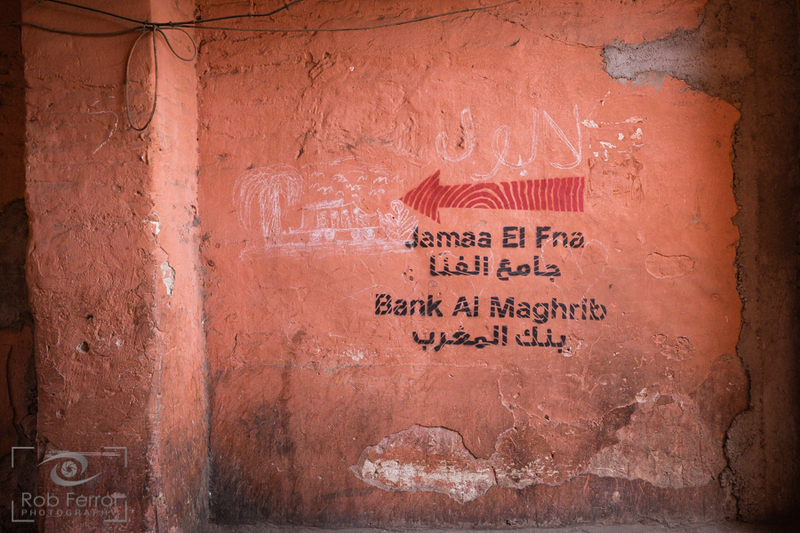 The alleyways of the souks are a maze and getting lost is all part of the fun. Almost anything is on sale from skins to bones and treasures to tatt. If you can’t find it in there then i dont think it exists. Be prepared to haggle and walk away if you dont get the price you like, very often they will chase you and agree to your offer. Their sales patter/technique can sometimes appear aggressive but dont let that stop you bargaining. Also watch out for the ‘ever helpful’ guides – young males who seem to be everywhere to help guide the lost looking tourist. As we found out they can, and will, lead you the wrong way, or the long way (but not always though) and expect a little payment at the end. Having already visited the Souks of Fez one thing i did notice in the Souks of Marrakech was the abundance of mopeds. The booming things were everywhere, even in the most crowded of places they were intent on pushing their way through and on the quieter alleyways they seemed to travel at some speed so do watch out for them. It’s something that i do not recall being an issue in Fez. The Palais La Bahia, Palais El Badi and the Medersa Ben Youssef each display fine examples of Moroccan architecture from the ages. With intricate mosaics, carved cedar wood and the finest moulded plaster walls that any modern day architect would find difficult to emulate. 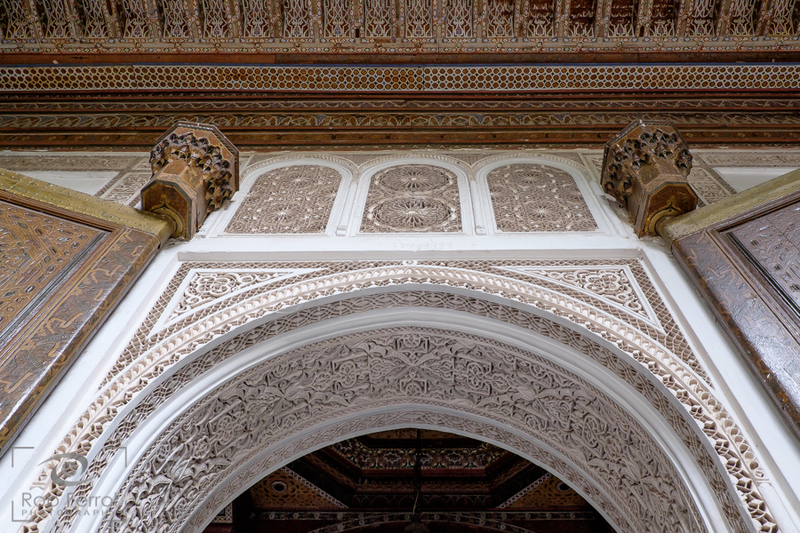 Listen for the Storks nesting on the walls of the Palais El Badi, they make the strangest noise at dawn & dusk. 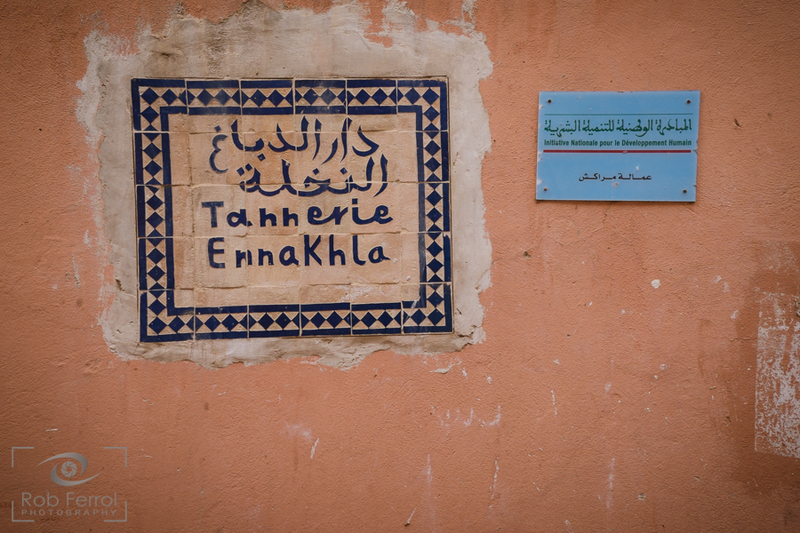 “Berber TV” at the Casbah of Telouet. Morocco is truly an amazing place and has much to offer any traveller, certainly more than one visit could cover anyway, so im hoping to make a return visit myself sometime soon. If you’d like to experience a different lifestyle & culture then be sure to put it on your bucket list. As always, if you enjoyed this little blog please do leave me a comment and also feel free to share it on your social media sites.